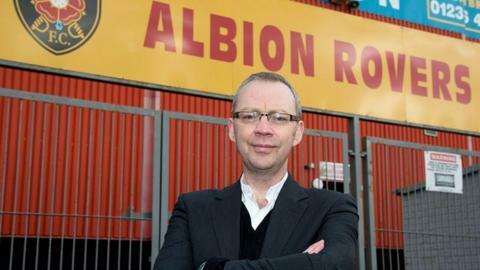 Albion Rovers chairman John Devlin admits the club's new 'pay what you can afford' season ticket initiative is a risk. Scottish League Two Rovers believe they are the first club in the United Kingdom to offer such a scheme. "We want the club to be part of the community in Coatbridge to do that we need an audience," said Devlin. "At the moment we have a hard-core support of a few hundred, we want to boost that." The Cliftonhill club, who have a minimum charge price for the season tickets, finished the season outside the promotion play-off zone but almost caused a surprise in the Scottish Cup when they took Rangers to a replay. "It's absolutely a risk and a risk we're willing to take," added Devlin of the new season ticket scheme. "It's worth taking. "We're trying to re-stimulate a crowd here, re-stimulate interest in Albion Rovers in Coatbridge, bring along a bigger audience to watch the football. "We are good value, even for a normal entry ticket, compared to other clubs in Scotland. "We don't know how many we'll sell. We did a similar exercise with a one-off game back in January. We had a 'pay what you can' game at that time and it went very well for us. "In every metric that we measured it was an overwhelming success."